The bear is so silly. It's a really funny and weird slice of life anime. A girl in a small village wants to move to the city, but her talking bear friend want her to stay. That's more or less what it's all about. The humor is, different, so many people will hate it, and very few will like it. Some jokes will make you picture things you'll want to forget, and the immature girl is so childish it's borderline un'bear'able. 6.4 on MyAnimeList, so you can probably assume you wont like it unless you enjoy those weird shows hardly anyone even remembers. It is difficult to put into words how badly this show messes up its last few episodes. Never before have I enjoyed the majority of a show for it to then convince me toward its conclusion that not only was I wrong, but the hours of enjoyment I had gotten up until that point had been retroactively soured and wasted. Girl meets Bear, Child hood friends! 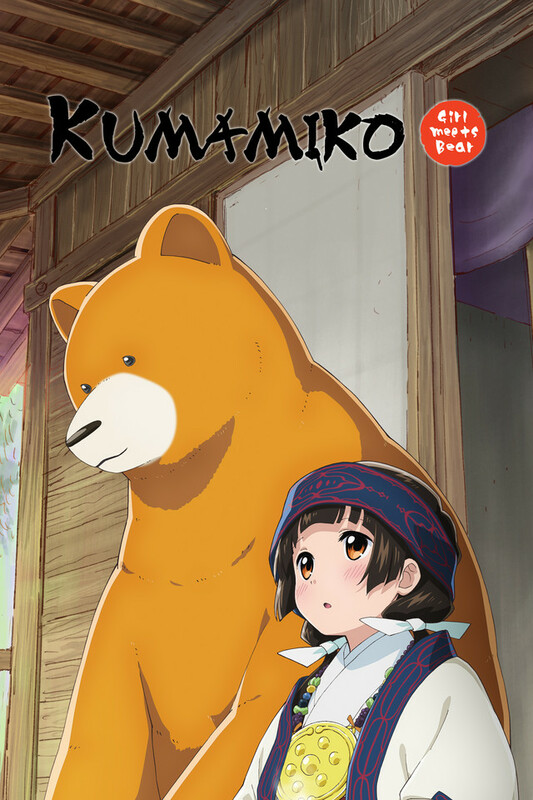 Kumamiko or Girl meets bear. I found this show by clicking the random button on crunchyroll a whole bunch, because i needed a new tv show to watch. And i loved it. This show was better than expected, it is a cute slice of life comedy about a girl named Machi and her Bear best friend since childhood Natsu (he's great). The show has some funny parts in it, some romance, and in some episodes Machi can be on the annoying side. The series is centred around Machi learning what life is like outside of the village, And trying to adapt to the outside world, you get introduced to Natsu, Yoshino, Hibiki. (the main cast) and the villagers. and you watch as Machi goes about her daily life to overcome her social anxiety and many other things with the help of her friends. Not the most complex or nail biting story line but I wouldn't go as far to say don't waste your time on watching. Was mostly drawn to continue watching due to the antics of the bear but the girl was mildly irritating. Was also baffled about the exact details of her town. This is a very funny show and one of the most adorable I've ever seen. It does a good job of capturing "a country bumpkin's" difficulties with the modern world without disrespecting rural people. Unfortunately, the ending is a bit weak and some of the comedy is too pervy to share with children. I relate to Hibiki because I, too, have experienced intensive psychological trauma in my childhood. The dead-looking eyes are real, by the way. The thing about this anime is, they try to establish that it's not external factors that are affecting her: Machi has a complex built up that makes her hypersensitive to what people think of her, yet nothing is ever done to establish where this originates. You could say that this isn't that kind of anime, but they took the time out to explicitly define Hibiki's case in the context of the story - but not for Machi. Could it be that this backstory is related to the backstory of why the bear got neutered in the first place?? With that said, no one should ever watch this anime under any circumstances. Cute premise, but sub-par execution. Review will have potentially minor spoilers for the series. But seeing as I do not recommend it? Either way, read at your own risk. Machi, the main protagonist, is an incredibly sheltered girl who must get over her crippling fears and anxiety to get what she wants. This includes doing anything involving the public, dealing with electronics she is unfamiliar with, and even a basic understanding of simple questions and concepts. Spoiler warning: She never succeeds at this and basically learns nothing by series end. The other characters fail to develop as well. Her cousin, Yoshio, is driven to see their small, dwindling village revitalized. But to get to this end, he is more than willing to sacrifice his younger cousin's happiness (who he himself admits is more like a little sister to him) in order to get it. He, also, fails to learn any real lessons by the series end. The other female protagonist, Hibiki, is one of the two well developed characters in the show. She is a brash, smoking, motorcycle riding troublemaker and childhood friend of Yoshio's. It is made clear early on that she has feelings for him, going so far as to put up with his idiocy to get close to him... All for nothing, as Yoshio barely even acts as a friend to her beyond having a nickname for her. Their relationship never goes anywhere and her only real development with another character is with Machi, who she sort of befriends. COME COME HERE KID COME!!!!! CHILD LOVERS WILL LOVE THIS SHOW! :(hu8fdshfefuebufbrubrgbrugbuegrughryhgryghryghrhgrughrughrughrughrughrughrugrhughrughrugrhugrhgurghrughrughrughrughrughrugrhugrghrughrughruhgrghrughrughrughrughrughrughrughrughrugh JUST TO MAKE THIS REVIEW LONGER!!!! Honestly one of the worst shows i have ever watched. The show has elements of borderline pedophilia in which a grown up man tries to undress the main character (who is really, really young) and then justifies it by saying that he sees her as his younger sister. That's right, the characters themselves do not realize how wrong it is. It happens more than once also. Otherwise pretty boring story. Had one or two funny moments.